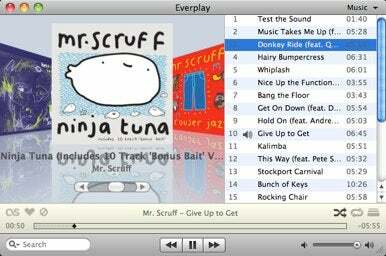 iTunes's dominance as the Mac's music player is getting challenged a little more often lately, and Snarbsoft’s Everplay is the latest contender. Rather than supplant iTunes, though, Snarbsoft decided to make peace with Apple's player and work with it. Good things can happen when we all can get along. Everplay is essentially a replacement for iTunes, but not your iTunes library. Snarbsoft bills it as a smaller, more efficient, and more social media player than iTunes: Everplay’s interface strips out a lot of the window and toolbar cruft, leaving just a few controls wrapped around a Cover Flow album panel. But instead of asking you to create a whole new library and start all over with arranging media or creating playlists, Everplay simply draws from your existing iTunes music, podcasts, movies, and playlists. This means it is not really a library editing or management tool—when you’re done organizing media or buying new music in iTunes, you can use Everplay as a more convenient player and social sharing tool throughout the rest of your day. One of Everplay’s strengths is global, customizable keyboard shortcuts for skipping, searching, and even rating media. It also integrates with Twitter and Last.fm, a social network for discovering and streaming new music. Everplay will tell Last.fm which tracks you listen to, and like Apple’s iTunes Store Genius recommendations, the social network will recommend similar artists based on the rest of its users’s habits. Use Everplay’s shortcuts to “love” and “ban” tracks, and Last.fm will become an even smarter music buddy that never questions your taste. About the only major gripe I have is that Everplay cannot support iTunes-Store-bought videos, though we have the studios and their DRM to blame for that. With a healthy set of customizable features and a stay-out-of-your-way interface, Everplay is a great addition to any media lover’s Dock (or menubar, if you prefer).